Today marks the centenary of the Battle of Jutland, the only major sea battle of World War One. More than 6,000 British and 2,500 German men and boys lost their lives as a result of the battle off the coast of Denmark. Other casualties received medical treatment at the Royal Naval Hospital, Queensferry. We'll leave it to others to describe the details of the battle. The National Records of Scotland and the BBC, for example, have descriptions of the events. 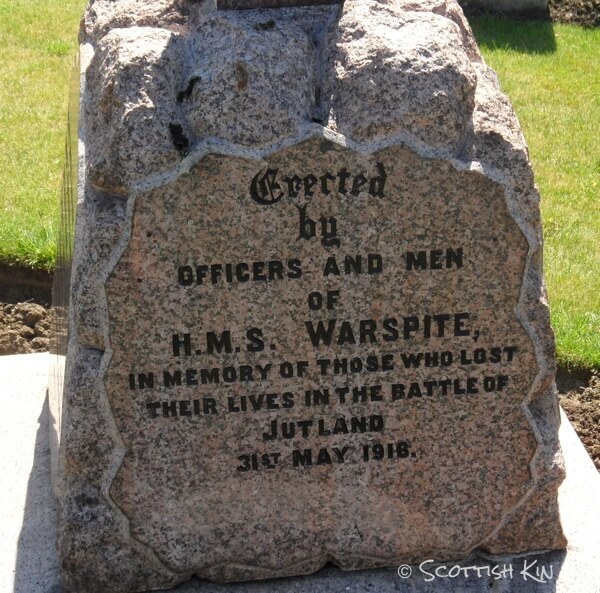 At least forty of those killed during the Battle of Jutland or whose wounds proved too great were buried in Queensferry Cemetery. 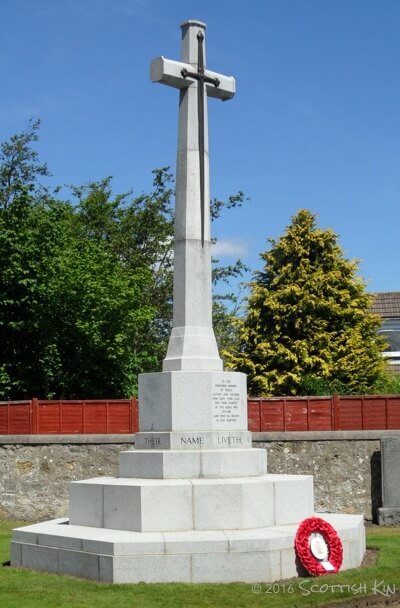 Thirty three men were buried in a single ceremony on 5 June 1916: five officers and twenty eight men. All the Admirals in the vicinity attended the service, accompanied by over 200 officers and men from the Fleet. Religious services were conducted by Church of England & Roman Catholic chaplains and a Wesleyan minister. A service of remembrance was held in Queensferry Cemetery on Saturday 28 May 2016, when the Princess Royal laid a wreath at the memorial. 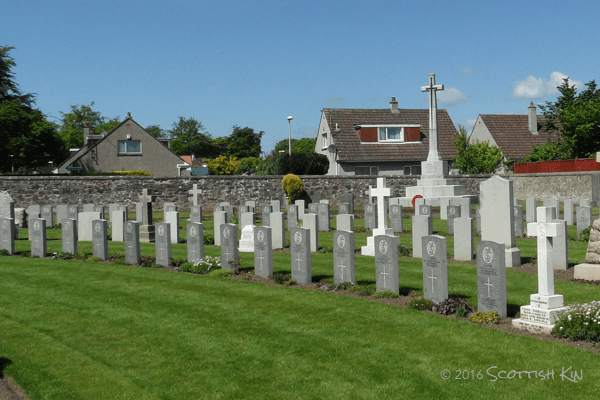 The Commonwealth War Graves Commission continues to care for the graves. The Royal Naval Hospital at South Queensferry received 110 badly wounded men from Jutland, most suffering from shell wounds and burns. Many of the wounds had become septic, despite the excellent treatment administered on board ship and even though it was less than 48 hours since the injury had been sustained. When war broke out an anonymous donor had offered to establish a base hospital and the Queen and Princess Charlotte had given the hospital to the Navy at Queensferry. Completed in only three months in 1914, it was specially designed to cope with any emergency encountered by the Fleet in the North Sea and had capacity for a hundred patients. Experienced Naval medical staff were therefore available to help the wounded, even though most of them had themselves only recently arrived in Queensferry. Surgeon Commander Paul Hohling Mills STAR, OBE After qualifying as a doctor in 1892, he joined the Royal Navy in 1895, and was sent to Queensferry in April 1916. For his valuable services on H.M.S. “Conqueror” and at the R.N. Hospital, Queensferry he was appointed an OBE by the King on 19 August 1919. Nursing Sister Sarah Edith McCLELLAND, ARRC of the Queen Alexandra’s Royal Naval Nursing Service (QARRNS). After training in London, she joined the QARRNS in February 1911 and came to Queensferry in early May 1916, having gained a great deal of experience in a range of naval hospitals including a year on the hospital ship “Magic”. 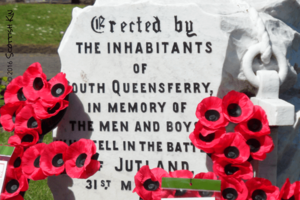 She spent the rest of the war in Queensferry. She was described as even-tempered, quiet and cheerful, “conscientious & hard working, esteemed by patients” and was awarded the Royal Red Cross for her nursing service in 1918. Temporary Surgeon Walter Martin ASH qualified in December 1912 from the University of London, joined the Navy in October 1914 and came straight to Queensferry. After the war Walter became the County Medical Officer for Derbyshire. Temporary Surgeon Cecil Pembrey Grey WAKELEY. Having qualified as a surgeon in 1915 he enlisted as a temporary surgeon with the Royal Navy. Described as an “exceptionally good surgeon”, Cecil Wakeley arrived in Queensferry in February 1916. In May 1917 he transferred to the hospital ship “Garth Castle” for the rest of the War, although he did briefly return to the Queensferry hospital as a patient (with a septic finger) in October 1917. He went on to have an illustrious medical career at King’s Hospital and the Royal College of Surgeons. Nursing Sister Ada Muriel JOHNSON trained at St Thomas’ Hospital, London and joined QARRNS (Reserve) in September 1914, being appointed to Queensferry on 1 June 1915 where she served until she moved to Chatham Naval Hospital in July 1917.